سالک بافقی, محمدرضا, خبیری, محمدمهدی. (1396). بررسی اثرات دانه‌بندی و شکل سنگدانه‌ها بر مقاومت لغزندگی مخلوط‌های آسفالتی با استخوان‌بندی سنگدانه‌ای. پژوهشنامه حمل و نقل, 14(1), 218-236. محمدرضا سالک بافقی; محمدمهدی خبیری. "بررسی اثرات دانه‌بندی و شکل سنگدانه‌ها بر مقاومت لغزندگی مخلوط‌های آسفالتی با استخوان‌بندی سنگدانه‌ای". پژوهشنامه حمل و نقل, 14, 1, 1396, 218-236. سالک بافقی, محمدرضا, خبیری, محمدمهدی. (1396). 'بررسی اثرات دانه‌بندی و شکل سنگدانه‌ها بر مقاومت لغزندگی مخلوط‌های آسفالتی با استخوان‌بندی سنگدانه‌ای', پژوهشنامه حمل و نقل, 14(1), pp. 218-236. سالک بافقی, محمدرضا, خبیری, محمدمهدی. بررسی اثرات دانه‌بندی و شکل سنگدانه‌ها بر مقاومت لغزندگی مخلوط‌های آسفالتی با استخوان‌بندی سنگدانه‌ای. پژوهشنامه حمل و نقل, 1396; 14(1): 218-236. مقاومت لغزندگی بر اساس تعریف به معنای نیروی بازدارنده و مقاومی است که توسط اندرکنش بین روسازی و چرخ قفل شده ایجاد می‌شود. مخلوط‌های با استخوان‌بندی سنگدانه‌ای1 (SMA)، مخلوط‌های آسفالتی گرمی می‌باشند که به دلیل وجود درصد بیشتری از مصالح سنگی درشت دانه مقاومت بالایی در برابر لغزندگی دارند. با توجه به اهمیت استفاده از مخلوط‌های SMA به عنوان یک لایه‌ی رویه مقاوم در برابر بار و لغزندگی و توجه خاصی که اخیراً در کشورمان برای استفاده از این نوع مخلوط‌ها صورت گرفته است، در این تحقیق به منظور ارزیابی مقاومت لغزندگی این نوع از مخلوط‌ها، تاثیر پارامترهای مختلف خصوصیات مخلوط‌های آسفالتی، از قبیل میزان قیر، نوع مصالح، دانه‌بندی و حداکثر اندازه اسمی مصالح2 (NMAS ) و شکل مصالح سنگی درشت دانه بر مقاومت لغزندگی مخلوط‌های آسفالتی SMA مورد بررسی قرارگرفت. اثر بافت ریز نمونه‌های آسفالتی به کمک دستگاه پاندول انگلیسی و بافت درشت نمونه‌های آسفالتی به روش پخش ماسه انجام پذیرفت. در ساخت نمونه‌های آسفالتی SMA از چهار نوع مصالح آهکی، سیلیسی، سرباره فولاد و سنگدانه بازیافتی از روسازی‌های آسفالتی و یک نوع قیر ( 70/60 ) به همراه الیاف پشم سنگ استفاده شد. مخلوط‌های SMA دارای چهار نوع دانه‌بندی با حداکثر اندازه اسمی مصالح 19، 5/12، 5/9 و 75/4 میلیمتر بودند. روش طراحی مخلوط‌های SMA بر اساس روش ارایه شده در استانداردهای بین المللی انجام گرفت. نتایج حاصل از این تحقیق نشان داد که مصالح سرباره از لحاظ مقاومت لغزندگی عملکرد بهتری نسبت به مصالح سنگی دیگر دارد و همچنین مقاومت لغزندگی نمونه‌های آسفالتی SMA رابطه مستقیمی با افزایش مقدار حداکثر اندازه اسمی سنگدانه‌ها دارند و دیگر اینکه سنگدانه‌های مکعبی از مقاومت لغزندگی بیشتری به اندازه 5 تا 10 درصد نسبت به سنگدانه‌های سوزنی و پولکی برخوردار می‌باشند. Based on definitions, skid resistance means the preventive and resistant force which is made by interaction between pavement and the lock wheel. The stone matrix asphalts (SMA) are the warm asphalts mixture which have high strength against skid because the existence of more percentage of coarse aggregate. With consideration of the importance of using the mixtures of SMA as a covering layer which is resistant against skid, and recently particular consideration about using these kinds of mixtures in Iran, so in this research for the evaluation of skid resistance of these kinds of mixtures, the influence of various parameters of asphalt mixtures assessed, such as the amount of bitumen, the kind of aggregate, graduation and the nominal maximum aggregate size (NMAS) and the shape of coarse aggregate in skid resistance of stone matrix asphalt (SMA). Respectively, the influence of microtexture and macrotexture of asphalt specimens was done with the British pendulum tester and sand patch method. From four kinds of lime aggregate, silica aggregate, steel slag and recycling aggregate from the asphalt pavements, and also one kind of bitumen (60/70) with the fiber of rock wool, were used in construction of asphalt specimens of SMA. The mixtures of SMA have four kinds of graduation with nominal maximum size of 19, 12.5, 9.5 and 4.75 mm. The way of design of mixtures of SMA, was used based on the way of proposed in the 425 report which is related to the project of NCHRP9-8. The results of this research showed that the slag aggregates have the better performance in skid resistance than other aggregates. And also the skid resistance of asphalt specimens of SMA has the direct relationship with the increase of the amount of nominal maximum aggregate size (NMAS) and one thing which should be mentioned is that cubic aggregates have 5 to 10 percent more skid resistance than elongate and flaky aggregates. -Ahadi,M.R. and Mansorkhaki,A.,(2010), Effect of macro-texture pavement on skid control and crash reduction, Transportation Engineering Journal,Vol.1 No.4.pp10. 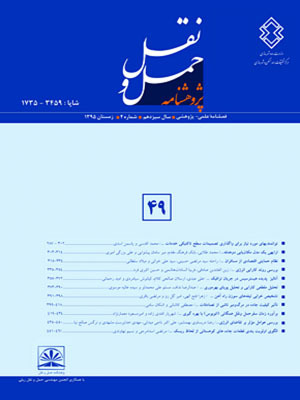 [in Persian]. -Ameri, M.(2009), Investigation of Stone gradation effect on asphalt pavement skid resistance,4th National civil engineering conference, Tehran university,pp10[in persian]. -Ameri, M., Behnood, A., (2012), "Experimental Investigation of Stone Matrix Asphalt Mixtures Containing Steel Slag", Scientia Iranica, 19(5), pp.1244-1219. -ASTM C131, "Standard Test Method for Resistance to Degradation of small- Size Coarse Aggregate by Abrasion and Impact in the Los Angeles Machine, American Society for Testing and Materials. -ASTM C127, "Standard Test Method for Density, Relative Density and Absorption of Coarse Aggregate, American Society for Testing and Materials. -ASTM C128, "Standard Test Method for Density, Relative Density and Absorption of Fine Aggregate, American Society for Testing and Materials. -ASTM E303, (1993), "Test Method for Measuring Frictional Properties Using the British Pendulum Tester", American Society for Testing and Materials. -Asi, I. M., (2007), "Evaluating Skid Resistance of Different Asphalt Concrete Mixes", Building and Environment, 42(1), pp.325-329. -BaraziJomoor, N., Fakhri, M., (2013), "Comparing Effect of Skid Resistance on Porous Asphalt Mix and Conventional Hot Mix Asphalt, Journal of Basic and Applied Scientific Research, 3(2), pp.838- 842. -Brown, E.R., Cooley, L.A., and JR., (1999), "Designing Stone Matrix Asphalt Mixture for Rut-Resistant Pavement", NCHRP, Report No.425, National Cooperative Highway Research Program, Transportation Research Board, National Research Council, Washington. -Burak, S., Onsori, A., (2014), "Effect of Aggregate Shape on the Surface Properties of Flexible Pavement", Journal of Civil Engineering, 18(5): pp.1364-1371. -BS 812: Section105.1, 105.2, Determination of Aggregate Particle Shape (Flakiness and Elongation index). -Bessa, S., Branco, C., (2012), "Evaluation of Different Digital Image Processing Software for Aggregates and Hot Mix Asphalt Characterization", costruction and Building Material, 37, pp.370- 378. -Chan, C.Y., Huang, B., (2010), "Investigating Effect Of Asphalt Pavement Condition on Traffic accidents in Tennessee Base on The Pavement Management System", Volume 44, Issue 3, pp. 150-161. -Cao, W., and Liu, S., (2013), "Comparsion of Stone Matrix Asphalt Mixture Using Basalt and Limestone aggregates, Construction and Building Materials 41, pp.474-479. -Fakhri, M., Taribakhsh, M., (2014), "Studing the Effect of Gradation and Macro Texture Generating by the Method of Gravel Distribution, on the Skid Resistance of the Concrete Pavements", Journal of Civil and Environmental Engineering, Vol.43, Issue.4. -Fuents, L.G., (2009), "Investigation of the Factors Influencing Skid Resistance and the International Friction Index", A Thesis Submitted in Partial of the Requirements for the degree of Doctor of Philosophy, university of south Florida. -Foutohi,A. (2009), “Spss Manual Book”,Sheigan publishing , pp.540. -Iranian management and planning Organization (2000), “Design and laboratory evaluation of asphalt mixture with Stone mastic asphalt-SMA ", Publishing number 206, Frist Edition, Iran, pp.88. -Hamzah, M.O., Mohamed, A., (2004), "Texture Depth Determination Stone Mastic Asphalt", 3th Eurasphalt and Eurobitume Congress Vienna. -Hamzah, M.O., Ahmad Puzi, M.A., and Azizli, K.A.M., (2010), "Properties of Geometrically Cubical Aggregates and ITS Mixture Design", IJRRAS 3(3). -Hafez, I., Kamal, M.A., and Mirza, M.W., (2015), "An Experimental Study to Select aggregate gradation for Stone Mastic Asphalt", Journal of the Chinese Institute of Engineers, 38:1, pp.1-8. -Liapis, I., Likoydis, S., (2012), "Use of Electric Arc Furnace Slag in Thin Skid – Resistant Surfacing", Procedia- Social and Behavior Sciences 48, pp.907- 918. -LEE, Y.P., Choo,Y.S., (2005), "Effect of Pavement Surface Texture on British Pendulum Test", Journal of the Easstern Asia Society for Transportation Studies, Vol.6, pp.1247 – 1257. -Yongjie, X., Shaopeng, W., Haobo, H., and Jin, Z., (2006), "Experimental Investigation of Basic Oxygen Furnace Slag Used as Aggregate in Asphalt Mixture", Journal of Hazardous Materials, B138, pp. 261–268. -Pourtahmasb, M.S., Karim, M.R., (2014), "Performance Evaluation Of Stone Mastic Asphalt and Hot Mix Asphalt Mixture", Advance in Materials Science and Engineering, pp.12. -Shah,S.M.R., Abdullah, M.E, (2010)," Effect Aggregate Shape on Skid Resistane of Compact Hot Mix Asphalt", Second International Conference on Computer and Network Technology, Bangkok, Thailand. -Younes Ahmed, H., Hashem, M.D., (2014), "Investigation of Aggregate Particles Shape on Characteristics of Hot Mix Asphalt", Journal of Engineering Sciences Assiut University Faculty of Engineering, Vol.42, No.6, pp. 1349- 1366. -Zhang, L., Ong, G.P., (2013), "A Numerical Study on the Influence of Aggregate Size on Skid Resistance Performance of Porous Pavements", Journal of the Easstern Asia Society for Transportation Studies, Vol.9­.